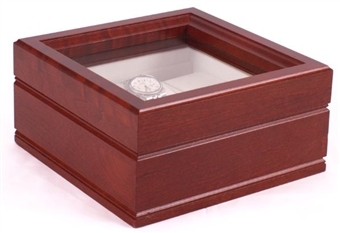 American Chest "Lieutenant" watch box - 6 watches, glass top made of solid American cherry hardwood with soft-Suede linings and 6 supple "watch Pillows" Holds up to a 60mm timepiece. Also in Mahogany finish search W06M. Made in the USA. 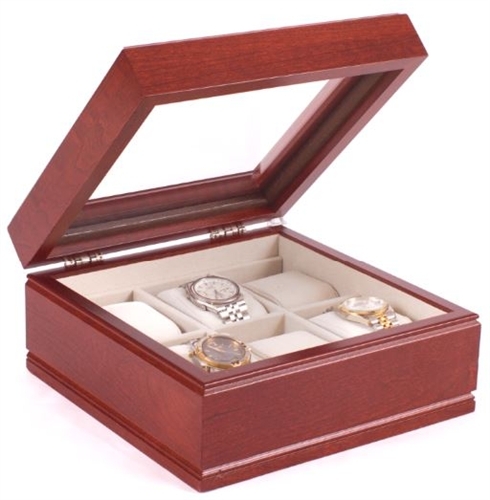 Wooden Watch Box, Glass Top - Cherry Finish Men's Modern Ebony Valet Box with Jewelry and Watch Storage Glass Top Solid Wood Watch Box, Mahogany Finish Wood Watch Box with Lock. Display Window and Storage for 10 Watches.